Part of today’s Kindle ebook deal of the day over at Amazon is Harry Harrison‘s Make Room! 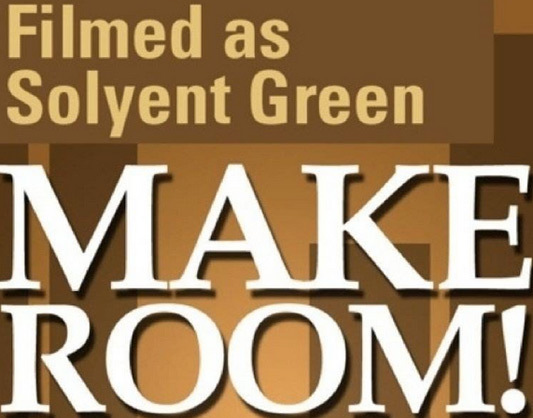 Make Room!, which was the basis for the 1973 film Soylent Green, for only $1.99 (that’s 88% off the regular price of $16). If you’d like to purchase a physical copy of More Room! More Room!, the book is also available in paperback. Note – this deal is valid only for today, Thursday, February 21, 2013, until 11:59pm PST. Other ebook deals today include The Cider House Rules by John Irving (great book, highly recommended!) for $1.99; A Midwife Crisis by Lisa Cooke for $.99, and Elmo Loves You by Sarah Albee for $.99.